Get the most savings when you sign up for HughesNet satellite internet. Free installation and savings on your monthly bill. New HughesNet residential subscribers can get $99 in instant savings by choosing the Equipment Lease Plan. Offer ends 6/26/19. New customers must choose the Equipment Lease Plan to qualify for the deal. Enter your zip code or home address to see what HughesNet deals are available in your area. Save $10 on your monthly bill for 12 months when you subscribe to HughesNet internet as a first-time customer. Ends 6/26/19. New residential subscribers must have HughesNet internet available in their area. Any data plan can qualify. 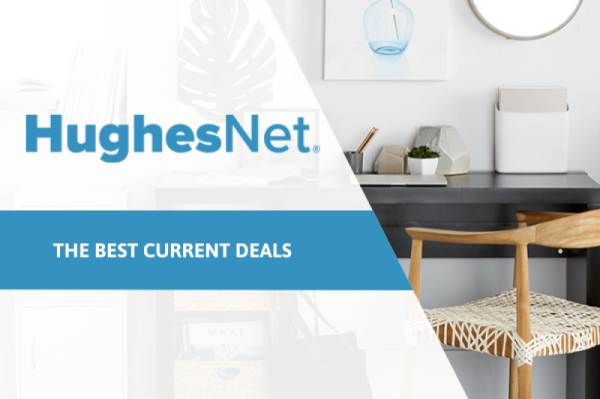 Check to see if this HughesNet deal is available in your area by entering your zip code in our comparison tool. New HughesNet Internet subscribers can get free standard installation when they select the Equipment Lease Plan. New customers must choose the Equipment Lease Plan. HughesNet promotions vary by location, so make sure that you can get the most savings by entering your information in our online search tool. Where it’s available: HughesNet is available everywhere due to their satellite technology. For more information about pricing in your area, use our zip search tool and enter your zip code or address. Qualifying for one of HughesNet’s promotions will significantly reduce your overall costs. As a new internet customer of HughesNet, you can save over $300 on installation fees, set-up fees, and your monthly bills. If you decide to lease your equipment, you’ll get $99 in instant savings which will basically pay for your set-up fee. Your leasing fee will also be reduced to $10 a month for the first year. Free standard installation is also included in your internet plan. Where it’s available: HughesNet is widely available everywhere around the United States. Enter your zip code or address to check if this internet provider is available where you live. On Demand/Channel Perks: DIRECTV offers 45,000+ On Demand titles that you can watch on the go with the DIRECTV mobile app. You can stream on up to 5 devices at once. Bundle HughesNet 30 GB Plan, HughesNet Voice, and DIRECTV to get the most savings out of your home services. You’re able to get free standard installation as a new customer, which saves you the trouble of having to schedule and pay more for someone to set it up for you. Additionally, after being a HughesNet subscriber for at least a year, you can earn a $100 Mastercard prepaid card by sending in a rebate form. This will virtually pay for a year’s worth of equipment fees. Where it’s available: Use our online comparison tool to see if HughesNet is offered in your area. Data: 30 GB. Reduced speeds at 1-3 Mbps once you reach your plan data. One of HughesNet’s special offers lets you save up to $300 in value when you sign up for their satellite internet service. For being a new customer, this provider will reduce your monthly service fee by $5. Combine HughesNet with DIRECTV and get access to thousands of the best shows and movies on live TV and On Demand. With a 30 GB plan from HughesNet, stream your favorite titles without worrying about reaching your limit. All DIRECTV packages include the monthly equipment fee for an HD DVR and a waived activation fee, cutting down your costs even more. *SAVE $10 ON YOUR MONTHLY INTERNET BILL: New residential subscribers only. After 12 months, plans revert to the standard monthly fee. Certain geographical areas are not eligible to receive offer. Offer ends 3/27/19. Restrictions may apply. Offer void where prohibited. *FREE STANDARD INSTALLATION: Free standard installation applies to new Lease subscribers only. Not valid with Purchase option. Limited-time offer. *FREE $100 PREPAID MASTERCARD:$100 Prepaid Card via rebate applies to new HughesNet residential subscribers only. HughesNet equipment and service must be purchased or leased between 1/17/19 and 3/27/19 and must remain active for a minimum of 31 days to qualify. Visit HughesNetRebates.com for details. Rebate submissions must be received by 6/27/19. Card expires 6 months from data issued. Certain geographical areas are not eligible to receive offer. Restrictions may apply. Offer void where prohibited.